Darren Jackson becomes most animated when he talks about coaching. 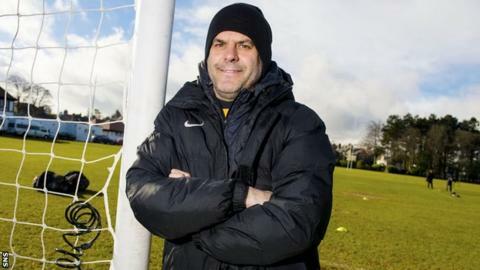 He spent a little under three years working with the first-team squad at Dundee United and those times seemed alive with promise. "They're our players, you still feel affection for them," he says. "Of course I'm hurt, it dents your ego, but we would have turned it round." Jackson was a talented, feisty, committed player. He missed the intensity of the game, its grip on his nerve and moods, when he worked as an agent following retirement. How could it after a career littered with such highs and lows? Even the beginning was dramatic, since Jackson went from playing for Meadowbank Thistle at Cowdenbeath to sitting on the bench at St James's Park for the visit of Arsenal. He was 19 when he moved to Newcastle United and was immediately thrust into the first-team. "I went on and Tony Adams brought me down for a penalty," he grins. Following two years at Newcastle, there were four years at Tannadice that started with Jackson injuring his ankle four minutes into his debut. He played a further three reserve games before acting on observations that he was walking oddly. "I went for an X-ray and the ankle was broken," he says. "I was out for six months." A boyhood Hearts supporter, Jackson then had to weigh up the offer of a move to Hibernian and thrived under the guidance of Alex Miller. It was enough to earn the big move of his career. Jackson became Wim Jansen's first signing as Celtic manager and admits that it took time to adjust to the sheer size and demands of playing for the club. He also had to come to terms with not being among the manager's first-choice XI and that tended to rankle, although the pressure of trying to stop Rangers winning a 10th consecutive title did not feel like a burden to the players. It was a tight-knit squad and Jackson had cause to rely on that support when he suffered an unexpected brain condition. "I woke up with a sore head and went to see the physio, Brian Scott," he says. "I went to the physio's room and they turned out the lights, so I lay there for five or 10 minutes. Wim came in and said, 'we need to name the team [for a UEFA Cup game against Tirol]' and I said I was struggling. "Afterwards, I found out the boys thought I'd bottled it. I got stick after it. They thought I wasn't handling the pressure." The Celtic doctor, Jack Mulhearn, was wary enough to book a scan for Jackson at the Southern General for the following day, when he received bad news. "They said, 'we've seen something and it's not looking good'," he says. "I went back into Glasgow breaking my heart, thinking I've waited until I'm 31 to get my biggest move and after six, seven games it's come to an end. I wasn't even thinking about my life. "Brian Scott phoned me that night and said, 'they don't know what it is and you need to go back in tomorrow'. "I had another scan and they said, 'it's hydrocephalus, water on the head' and I could see them being happy it wasn't what they first thought. "There are two valves in your head and one hasn't opened, so the water cant circulate properly. They drill a hole in your head and laser another passageway, to let the water circulate. "The only time I got upset was leaving my little girl, I drove away and I went… I thought, if this goes wrong, this could be the last time." That recollection brings tears back to Jackson's eyes, momentarily, but resilience was the overriding response. The operation went smoothly and he was only out for nine weeks before returning to the Celtic first-team. Jackson was only four feet away from Henrik Larsson and Tosh McKinlay when the two came to blows during a training session. "It was ready to boil over because a lot of foreigners had come in, there was a good squad of Scottish boys," Jackson says. "I can remember big [Marc] Reiper coming over, ready to go for Tosh and big Marsh [Gordon Marshall] was ready to go for Reips, but it didn't kick off. "I believe that went a long way to us winning the league, because it brought the whole team together. "Now, ability and handling the pressure of games wins you the league, but from that moment, it wasn't the foreigners and the British boys, everybody was together." Jackson left Celtic for a spell at Hearts under Jim Jefferies before his career began to wind down. There were other highs, though, not least being part of the Scotland squads at Euro 96 and France 98. He enjoyed his spell as an agent, but by the end was tiring of the financial challenges in Scotland and the sense of entitlement among some young players and their parents. Nothing can replace the feelings stirred by direct involvement in the game. "Waking up on a Saturday morning again with that knot in your stomach looking forward to a game, you can't buy that," he says.